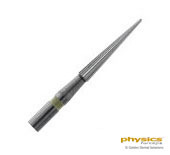 Golden Dental Solutions now offers three dental burs specifically designed to be used as ancillary armamentarium to the Physics Forceps during the tooth extraction process. Each of these dental burs is used regularly by Dr. Richard Golden to simplify the atraumatic extraction process with the Physics Forceps. As you will see in several of our videos, making a trench on the lingual aspect of the tooth (at the expense of the tooth, not the bone) can assist the beak of the Physics Forceps in obtaining a better purchase point. The burs outlined below are recommended by Dr. Richard Golden for such purpose. The Long Flamed Shaped Diamond Dental Bur is indicated to create a trench on the lingual side of the tooth to establish a better purchase point for the beak of the Physics Forceps. The cutting surface of the bur creates a groove in the tooth so the beak of the Physics Forceps has a firm purchase point. The Short Flamed Shaped Diamond Dental Bur is indicated to create a trench on the lingual side of the tooth to establish a better purchase point for the beak of the Physics Forceps. The cutting surface of the bur creates a groove in the tooth so the beak of the Physics Forceps has a firm purchase point. 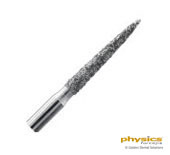 The Carbide Finishing Bur is indicated for finishing, smoothing or shaping composites. As background, dental burs are a type of burr (cutter) used in a hand piece by a dentist. 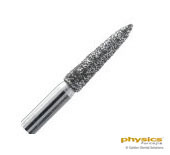 The first burs were made of stainless steel and were available in only a few simple head shapes, which later advanced with the introduction of carbide burs and diamond points. With the introduction of diamond points, the shapes of burs that are available to today's dentist have also evolved to a greater extent from what was available in the past. Burs are usually made of diamond or tungsten carbide. In general, burs have three components or parts which are the shank, neck and the head. The blades of a bur are contained in the head, which are used to remove material. These blades can be manufactured to be positioned at several different angles in order to change the property of the bur. Blades with a more obtuse angle will produce a negative rake angle that increases the strength and longevity of the bur, while those that have more acute angles will produce a positive rake angle and a sharper blade. The more acute angled and sharper blades tend to dull at a faster pace than the more obtuse angled blades. Burs come in various shapes, including, but not limited to round, inverted cone, straight fissure, tapered fissure, and pear-shaped burs. In the past, to increase cutting efficiency, there were additional cuts across the blades of burs known as cross cuts, but the benefit of such cuts has been minimized with the advent of high-speed hand pieces that dentists use today in their practices. There are many different burs, which are tracked in numbering systems including a U.S. system and a numbering system used by the International Organization for Standardization (ISO). Since burs are utilized worldwide, a single standard numbering system that gives a unique specification for each bur across the world is mandatory. The existing systems have tried to achieve the goal of simplifying the numbering, but the reality is that it is complex to memorize and ultimately not the best for practical usage by dentists.